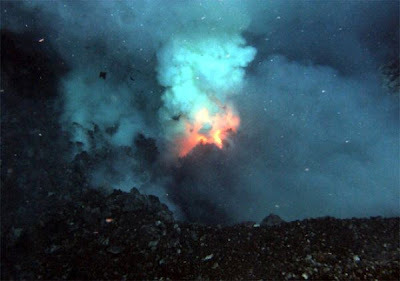 An interesting article that sheds light on new research corresponding with underwater volcanic activity. "The Earth's crust is broken into plates that are in constant motion over timescales of millions of years. Plates occasionally collide and fuse, or they can break apart to form new ones. When the latter plates break apart, a plume of hot rock can rise from deep within the Earth's interior, which can cause massive volcanic activity on the surface. When the present-day continent of North America broke apart from what is now Europe, 54 million years ago, this caused massive volcanic activity along the rift between the two. Prior to today's study, scientists had thought that such activity always occurred along the rifts that form when continents break apart. However, today's research shows that comparatively little volcanic activity occurred when the present-day sub-continent of India broke away from what is now the Seychelles, 63 million years ago. Researchers had previously believed that the temperature of the mantle beneath a plate was the key to determining the level of volcanic activity where a rift occurred. The new study reveals that in addition, the prior history of a rift also strongly influences whether or not volcanic activity will occur along it." Head over to Underwater Times to continue reading.